A hardy colourful small bushy tree with aromatic foliage on erect branches with brown flaky bark. The leaves are a mid green leaves. 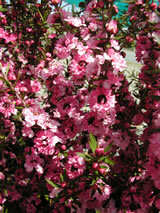 It has exquisite double flowers striped red and candy-pink in late winter and spring. Wonderful food for the bees. This is a cultivar of our most common native tree, it grows naturally in many different sites and is very hardy. Great for growing in difficult ground.